As a tall woman, you may think that 37" inseam jeans are hard to come by, but if you want the truth, they really are not. Here, I've brought together a comprehensive list of stores which provide an excellent selection of ladies long inseam denim styles. But, don't just take my word for it, have a look yourself! If there's an easy way to find women's 37 inch inseam jeans on any of the sites in my directory, I'll tell you. I will, also, point out if a specific store has retail locations to shop at, although this does not guarantee that they carry tall sizes in stock. Make sure to call ahead and ask before making the drive. Have fun shopping for your new favorite pair of tall jeans! TALL TIP: Check Alloy Apparel for a variety of 37" inseam denim options. You'll get Free Shipping on orders over $85! Alloy Apparel ($) Offers a wide selection of jeans and pants in 35" and 37" inseams as well as dresses, skirts, and tops in their Tall Shop. Plus sizes are available. Buckle ($$) Carries both mid-priced and designer jeans and pants with inseams up to 37". Shop online or at their retail locations. Gap ($$) Variety of long length jeans and pants in inseams up to 37". Also offers tops, tees, tanks, sweaters, dresses, skirts, coats, and maternity in tall sizes. You can find tall inseams at retail locations. 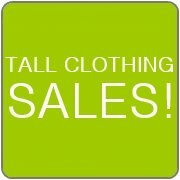 Long Tall Sally ($$) Specialty tall clothing store offering jeans and pants in up to 38" inseams. Also offers women's tall clothing such as tops, sweaters, dresses, skirts, suits, coats, activewear, sleepwear, swimwear, and maternity. Shop online or at any retail locations in the U.S., the U.K., and Canada. JCPenney ($) Tall and ultra-tall size jeans and pants. Also offers a variety of other clothing styles in tall sizes. Simply Tall ($$) Tall specialty shop with ladies jeans and pants in 37" and 39" inseams. Plus sizes are available. Skinny Jeans ($$$$) Offers a unique style of ladies skinny jeans meant to have a super-slimming effect on the legs. Designs come in a range of denim washes and colors.